When I saw this basket full of fragrance, or bath soaps and more accessories. I can't wait to end up the reception and just check it out myself. I am not sure why we girls/woman just love those kind of stuff. 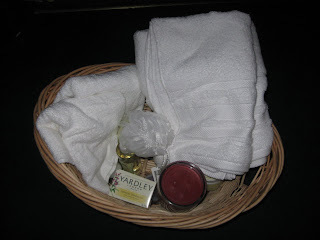 The only thing that Jeff can use will be the towel, hand towel, sponge and the candle which is also scented. It has a flavor and fragrance of and Orchid, everything is about orchid and butter. I love the smell because it is not strong and YES I have been using the body lotion and put it on my big belly to avoid stretchmarks. This was given by one of Jeff's co-worker at awning. hi nova john here. yes that was local shopping place to buy food. Ur link is ready with title pamangkinnakoni. please check it and don't forget link me too. preggy diay ka dhai? dah, kaulahi nako sa balita...anyway, gratz and hope you have a healthy pregnancy! @marie: yes, thanks for the concern dear... i'm on my 25weeks now...!